By 8th grade, Karin Divya Maus was already demonstrating a vocal range, capacity for belting, and stage presence that clearly identified her as a force to be reckoned with. This rising USC Thornton School of Music junior now envisions a career as a singer/songwriter that includes writing, arranging, and composing for other musicians, and in a variety of styles. 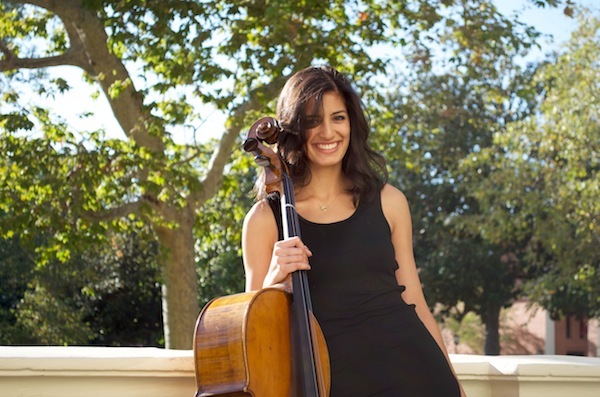 Divya grew up playing the violin and cello, in a household where classical instrumental music dominated. She spent the first part of her life in India, England, and Germany before moving with her family to the U.S. (Colorado) at age twelve. As a freshman in the Popular Music Performance Program at USC, Divya immersed herself in all the required aspects of performance, aural skills, recording, and music business. But her penchant for languages (she’s already trilingual in English, German, and French and is now studying Russian as well) and desire for more breadth in her choice of classes (including orchestration and conducting) led her to switch to the BA in music. Divya was selected from a highly competitive pool of applicants deemed to be the nation’s “most promising songwriters across all genres,” to participate in the 2011 Johnny Mercer Foundation Songwriters Project, a joint effort of the Johnny Mercer Foundation and the American Music Theatre Project at Northwestern University. Two dozen songwriters, ages 16 – 30, spent a week focusing on their area of emphasis (musical theatre, pop, rock, country, jazz, or contemporary pop). As with other summer music programs, the Songwriter’s Project gives participants the gift of time needed to dive into their pursuits without the typical schedule conflicts they face throughout the rest of the year. Divya has been amassing performance, songwriting, and arranging experience since her freshman year. She sings alto and does some arranging for USC’s a cappella group, Reverse Osmosis. She was chosen to sing at the annual Charles Dickens Dinner that supports music scholarships at USC, where singer/songwriter Richard Carpenter was honored. At the January 2012 NAMM show in Anaheim, she sang backup with a friend from the Songwriter’s Project who had just won the John Lennon Songwriting Contest. Divya has also performed as a singer/songwriter at the Grammy Museum in downtown Los Angeles with students from the USC Thornton Popular Music Performance Program, as well as at coffeehouses and performance halls around campus. Strengthen your music theory and aural skills, as well as your instincts, in order to be able to find your niche. Learn to use Sibelius, the music composition and notation software. Develop a large skill set that includes keyboard and rhythm proficiency. Singers need solid instrumental performance skills in addition to their vocal chops. Learn how to convey the meaning of the lyrics with your physical movements. If you don’t get what you want, at least learn how to ask for what you need. Develop other interests. Non-music-related experience and knowledge inform and enhance your music. Learn to balance your music with other aspects of your life. Include healthy and thriving relationships. Exercise! Take care of your health. According to Divya, the phrase “It’s awful out there” has become an expected description of what it’s like to try to work in her field. She knows that carving a niche for herself as a singer/songwriter will not be an easy path. Yet she’s compelled to move forward in this direction. She reflects upon the mixed message of having a “back up plan” that many music school students get from their parents and teachers. On the one hand, she feels that developing a “fall back” career reflects less than full commitment to life as a musician. On the other hand, she also recognizes that she may need to take a job that isn’t music-related, until she can find her way into a viable singer/songwriting career. Her facility with languages offers Divya an obvious and realistic alternative path she may need or want to pursue. 1. Start thinking about and planning for the audition process in the summer. Don’t wait until fall, when the demands of school kick in again. 2. The quality of your pre-screen material makes a difference! 3. Set challenges for yourself so that you are ready to distinguish yourself when you go for your live auditions. 1. Do what you can to be healthy for your auditions. 2. Have someone you trust accompany you, if at all possible. 3. Distinguish yourself as a person. Say something that will make the judges remember you. 4. Don’t be boring, even in what you wear to your auditions. What are other Bachelors of Arts degrees that are similar to singer/songwriter? Students who want to pursue a career as a singer/songwriter typically major in programs labeled as popular or contemporary music, composition, or music industry. Every school is different, so check carefully the classes you’d take and the opportunities offered at all schools you’re considering. Check out this article to learn more: Thinking of Majoring in Popular Music? I feel like this is a great step towards music. Its not necessarily a back up plan. Something on the side that is a part of music is healthy and not so overwhelming 🙂 I would take some thought in it so that you can do what you love and love what you do.